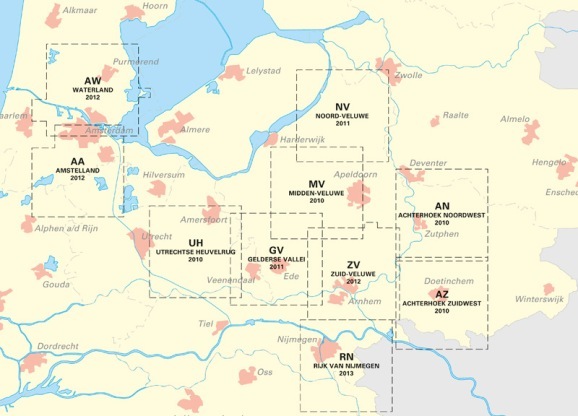 The Dutch topographic maps at the 1:25,000 scale mapping are extremely detailed and of excellent quality. For walkers, however, they have a few drawbacks: The small size and there are no overprints of existing trails. 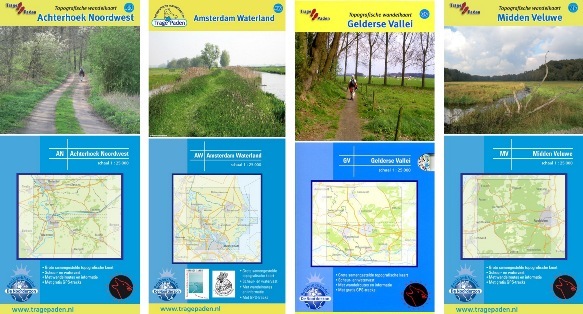 That's why THE NOORDERZON, a Dutch publisher of detailed mapping, is now publishing a series of new maps, based on the same cartography, but with overprints highlighting local and long-distance footpaths. Scale 1:25.000. A map covers a region of 25 by 25 kilometers! Printed on tear- and waterproof material (Polyart). This material is very flexible and endlessly re-folding. The high quality cartography of the Ordnance Survey (Land Registry Geo-information) has been accepted. Various marked walks: LAW routes (Long-Distance Footpaths), but also many corridors and walking paths are marked, accounting for a half to one full day of hiking. Long-Distance Footpaths LAW – routes): the names of the routes are mentioned on the maps. Of the remaining routes, marked with dashes, GPS tracks can be downloaded off the accompanying web site.